The field of fitness nutrition is a fast developing one, with research regularly discovering new ways to improve the performance of top level athletes. However, for most people, the first step is to get their every day eating right – if you are eating a healthy diet on a regular basis, you will be getting most of the things you need to achieve your fitness goals. When looking at fitness nutrition, there are two things to consider – what will good eating do for you (the benefits) and what will poor nutrition do to you (the problems). We’ll add a fourth that also needs to be included for good health and improved performance – water. Let’s look at each in turn. Water is crucial for athletes. You can survive up to three weeks without food, but without water you would be dead in two days. 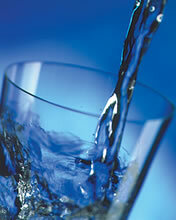 Research suggests that a large percentage of the population suffer from dehydration – why? Because they don’t drink enough water – they down gallons of sodas, coffee, and sweet fruit drinks, and ignore the one thing their body really needs. If you want to remain healthy and perform at your best you therefore need to drink water throughout the day – the rule of thumb is that you need at least eight glasses of water per day, but if you are exercising hard, especially in hot weather, you need to increase that. It's sometimes easy to underestimate the value of water in your fitness nutrition plan. • Sugars: Used for energy, these are found in fruits, some vegetables, milk, and most processed food and drink. • Starches: Also used for energy and found in all grains (including rice), all vegetables (especially potatoes) and most refined foods. • Fiber: Vital for good digestion, fiber is found in vegetables, whole grains, and unrefined foods. Not all carbs are the same however – sugars and some starches (e.g. mashed potatoes) break down very quickly in the stomach, causing your blood sugar to rise too quickly. The body responds by pumping out insulin, which takes the excess sugar and stores it as fat – you then feel hungry and low on energy, and want to eat more sugar to jack your energy levels back up. Your aim should be to get the vast majority of your daily carbs from the good sources, with only occasional forays into the bad carbs. Again, there are good and bad fats, and you need to choose the right ones. • Make bad (LDL) cholesterol rise and good (HDL) go down. • Increase your risk of heart disease, stroke, diabetes, and cancer. • Soak up antioxidants, thus increase cellular damage. • Affect (slow down) the function of brain cells. OK fats: Natural saturated fats – these are found in animal fats (milk, butter, cream, cheese, lard, meat) and some tropical oils (coconut and palm). They should be eaten in moderation, making up no more than 10% of your diet. • Natural polyunsaturates (unprocessed vegetable oil, nuts and seeds, whole grains, meat, dairy, eggs, fish and sea food). These include Omega 3 and 6, which research has shown to be vital for good health. Many people don’t eat enough protein – you should aim to include some protein with every meal. If this is difficult, consider supplementing with whey protein – whey is a fantastic source of protein, easy to add to fruit smoothies, and a great way to supplement your protein. Athletes should focus on getting their daily calories from fresh, natural ingredients – lean protein sources like fish and chicken, carbs from fruit, vegetables and whole grains, and good sources of fats like olive oil, nuts and seeds. Endurance athletes typically need a higher percentage of carbs in their diet, while those seeking to build muscle – or indeed lose body fat – can reduce carbs slightly and add more protein. Fitness nutrition isn’t hard if you stick to good, natural foods, and monitor your body’s response to your diet, by keeping a record of energy levels, workout quality, and weight.